Open MRI scans are available at Tahoe Fracture & Orthopedic Medical Clinic to those who reside in the Carson City, Nevada, area. Magnetic resonance imaging (MRI) scans use a magnetic field and radio waves to create detailed images of bones and soft tissue. 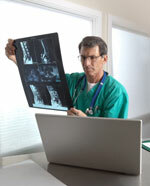 At our Carson City office, we frequently use MRIs to form diagnoses and rule out certain conditions. Claustrophobic patients — Patients who have struggled with claustrophobia in the past may find it difficult to remain within an enclosed MRI unit for the duration of the scan. In fact, even patients who have never exhibited claustrophobic tendencies sometimes experience claustrophobia for the first time while undergoing a traditional closed unit MRI scan. Pediatric patients — Young children may have a hard time undergoing a traditional MRI scan because the closed structure of the machine prevents them from holding onto a parent’s hand. Patients of exceptional size — Because traditional closed unit MRIs only allow for a certain amount of room within the machine, some larger patients (such as those with exceptionally broad shoulders) may have trouble fitting inside. At Tahoe Fracture & Orthopedic Medical Clinic, we understand that many people are concerned about undergoing a traditional closed unit MRI scan. That’s why we offer the opportunity to instead undergo an open MRI scan using Esaote’s S-scan machine, which features a wide, rotating table that simplifies patient positioning and maximizes patient comfort. Like other open MRI technology, our open MRI machine does not enclose the individual undergoing the scan, thereby eliminating any feelings of claustrophobia. We can use our open MRI machine to examine any area of the musculoskeletal system ranging from the shoulders to the feet. If you live in the Carson City, NV, area and you’re interested in learning more about the open MRI technology available at Tahoe Fracture & Orthopedic Medical Clinic, please contact us today. Our knowledgeable staff would be happy to answer any questions you may have.